It's the time of the year again that all Malays celebrating their holy month of Ramadhan! What we can't miss is always the "Buka Puasa" feast, breaking fast with a wide array of traditional Malay dishes! As usual, this is the time of the year that most hotels will offer their Ramadhan Buffet Feast with some attractive promotions and deals that will get us crazy. In Penang, Eastin Hotel is one of the top picks due to its ideal location as it is pretty near to industrial area. Best for companies to celebrate Ramadhan month and break fast with their scrumptious buffet feast. This year, Eastin Hotel is having their Early Bird promotions at only RM85 per pax! Featuring all the traditional Malay dishes and mouth-watering kuih-muih as well as some of the asian delights. 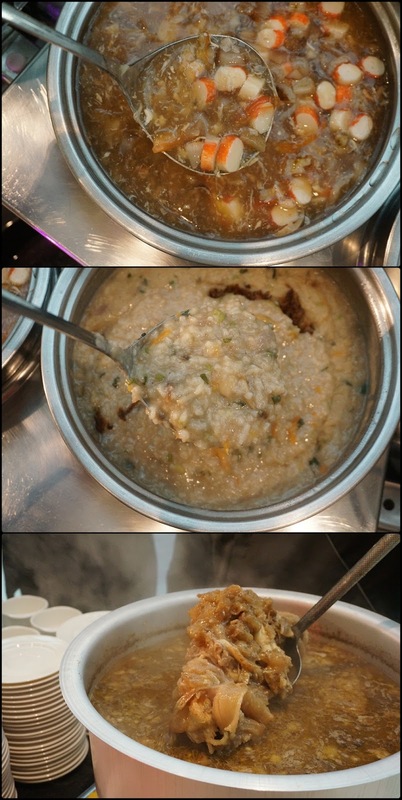 There were Seafood soup, Bubur Lambuk and their very signature soup, Gearbox Soup. It has been a great trend having soft serve in Penang recently. It is really getting popular and also the best to counter this kind hot weather in Penang with some nice and chilling soft serve. I've been hearing a lot about Godiva Chocolatier's soft serve and saw it launched in Kuala Lumpur outlets and other countries but not in Penang yet. Recently in the beginning of April, Godiva Chocolatier in Gurney Paragon Mall Penang also decided to launch their soft serve in Penang and ended everyone's waiting. Available from April 7th 2016 onwards, Godiva Chocolatier @ Gurney Paragon Mall will be serving their signature soft serve and their Chocolixir (Ice Blended) to all the Penangites. Godiva Chocolatier's soft serve is available in 3 flavours (Dark Chocolate, Chocolate Twist and Vanilla White Chocolate) whereas their Chocolixir is available in 5 flavours (Dark Chocolate Decadence, Milk Chocolate Decadence, Dark Chocolate Earl Grey, Dark Chocolate Raspberry and Dark Mint Chocolate). Both the soft serve and Chocolixir are priced at RM22.25 each. It was our first time so we gave the Chocolate Twist a try. The staff will prepare the soft serve on the spot. Since it was our first try, we ordered the Chocolate Twist flavour, which is the combination of Dark Chocolate and Vanilla White Chocolate as we are afraid that the Vanilla White Chocolate flavour could be too sweet. It turns out to be really great as the bitterness from the dark chocolate and sweetness from the vanilla white chocolate blended so well together. We like the soft and milky texture and it is really addictive. Now that we know why is it so popular. Though it was a bit expensive paying RM22.25 for a soft serve ice cream. But judging from the taste and quality. We wouldn't mind to reward ourselves once in a while aren't we? [Kuala Lumpur] Infusion: Specialty Coffee Co @ 1 Utama | Let's take a break from shopping! Being one of the specialty coffees in Kuala Lumpur. A decent cafe has been humbly operating coffee business July 2014. Infusion: Specialty Coffee Co is located inside 1 Utama Shopping Centre. Secretly located at the Old Wing of 1 Utama, Infusion: Specialty Coffee Co has been serving coffee, juices, some savouries to caters to all the workers around the area and also visitors of the mall. The store is not very big, and it is located at the center of the mall where it can be easily seen if you are doing your shopping on level 2. Simple setting and humble cafe in the mid of a major shopping mall in KL. Penang Fashion Week 2016 by Gurney Paragon Mall kicked off with the first day of fashion shows by Alden Leong from House of Alden and Keith Kee from Keith Kee Couture. Both of them are very talented fashion designer with all sorts of contemporary designs featuring different styles. With the theme of Street Vogue this year, Penang Fashion Week 2016 will showcase all the special designs for this year's Spring / Summer 2016 collections. It was a pleasure to be invited by Alden himself for his personal show. But I rejected at the first place and told him that I've got no sense of fashion and I did not know what to wear for the event. In the end I attend the event and didn't regret it when I get to see all his beautiful creations.